For the last month or so my mum had been wanting to visit Cannizaro Park to see the daffodils, but despite it being officially spring time, the weather had never been good enough. But at last, yesterday the sky was finally clear enough - although by no means sunny - to venture outside. Now I must admit that when I agreed to go with her, in the back of my mind I was asking, 'but we have daffodils in the garden, why don't you just look at those?' Now I understand. I was expecting just a big patch of lawns, and if we were lucky some wild daffodil seeds might have drifted into the soil and started to grow. I did not realised until we got there that it was part of an estate - and a beautiful estate at that. On the way there, we walked down the street of Wimbledon Village, doing some window shopping when we popped into a book shop. While I was browsing Mum asked for directions to the park; the shop owner said that it was just past Wimbledon Common, and then went on to say how they did the most exquisite afternoon teas. It looked like we were going to make a day of it. Covering thirty-five acres of land, Cannizaro Park is a three hundred year old garden with four hundred species of trees and many rare plants from across the world, which has given it a Grade II listed status. The park is named after Italian Duke of Cannizzaro, who owned the house in the early 19th century; he held regular parties and functions there, inviting guests such as the Duke of Wellington and King George the IV's mistress. It was not, however, opened to the public until 1949 when it was developed by the Wilson family into a series of gardens for visitors to explore. Sixty-four years on, Mum and I are two such visitors. We started off at the sunken garden, which was centred around a large urn, and surrounded by purple flowerbeds. A bit further on was the herb garden, which unfortunately due to the bad weather meant that the plant growth had been stunted. Usually it would be filled with rosemary, myrtle, fennel, and many more, but at the moment, it was just a patch of soil. There were, however, sheltered seating areas that you could sit down in when everything is in full bloom. The herb garden was a bit bare. The park has lots of nooks and crannies to explore, with paths leading to hidden clearings like the Dutch garden, or forest like settings. Many of the trees in the park have plaques on them to inform you what species they are, but since they are all in Latin, I am none-the-wiser. On the main lawn we had more success with a beautiful field of daffodils, including the common species, paler coloured daffies, and the little tete-de-tetes. This led us towards a trickling stream, which created a tranquil scene when surrounded by all the trees. We walked down some steps to the golf course, then turned into the Italian garden. With another Urn taking centre stage, the garden was based on symmetry and order over nature. At the top of the garden we a set of gates, which created a perfect portrait picture as the ducks swam by on the pond on the other side. A Mandarin wandered away from the pond. As well as Mallards, they also had Chinese Mandarins, and were constantly chasing each other and splashing about. There were also lots of squirrels. Although Cannizaro's logo is a rabbit, it really ought to be a squirrel, because the park was bustling with the happy hoppy creatures. They were not shy either, and clearly used to being fed. Instead of running away, one approached Mum expectantly, waiting to be given food. Sticking with the Italian theme, further along there was a statue of Diana, who for some reason had been bedecked with daffodils. She guided us to another enclosed garden turned into a maze of hedges, which then exited out to an open field with a blossom tree in the distance. On our final leg of the journey, I was wondering how we were going to find our way back to Cannizaro House; we had taken so many twists and turns, I didn't know where we were, but it turned out that we had come round in a complete circle, and were now back where we started. Originally called Warren when it was built in the 18th century, it was renamed Cannizaro in 1841 after the death of Sophia, the wife of the Duke of Cannizaro. 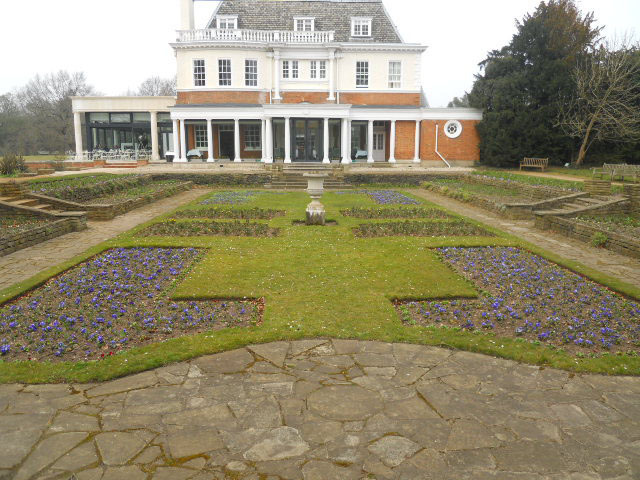 It was bought by the Wimbledon Borough Council in 1947 and used as a nursing home for a while until it was eventually sold and turned into a hotel. Cannizaro House is currently the only four-star hotel in Wimbledon, and although I can see it clearly deserves that rating, those stars will set you back £500-£1000 a night. Mum told me that afternoon tea would have to do. There are a choice of three rooms where you can eat. First there is the restaurant, which looks out towards the sunken garden, and is for staying guests, where they serve breakfast, lunch, and 'a la carte'. Next is the lounge, which is a low lit room with a piano, and clashing combination of artwork. Above the mantlepiece is a classic image of two cherubs that fits in with the history of the house, while on the opposite wall, they have taken a more contemporary approach with pop art by Jayson Lilley, whose bright green canvas sports the head of a cow. Last time I went for afternoon tea in an upstate lounge like this, I felt incredibly uncomfortable. Everything was so quiet, I was afraid to sneeze. I therefore opted for the third choice in Orangerie, which is a newly renovated al fresco style conservatory. The glass walls and ceiling made it a room filled with natural light, while the modern furniture allowed you to feel relaxed. As well as afternoon tea, they also have an oyster bar. Oysters cost £7 for 3, £12 for 6, or £22 for 24. I like oysters, but not that much. After spending £7, I don't expect to leave on an empty stomach. Afternoon Tea is expensive too, but at £25 a head, it was no more so than what I would expect from most other places too. We ordered tea for two, but we felt so stuffed by the end of it that I think tea for one would have been more than sufficient. Their afternoon tea is served between 3pm-6pm and includes finger sandwiches, two buttermilk scones, a selection of cakes and pastries, plus a pot of herbal tea. While Mum had Planter's afternoon tea, I went for a fruit infusion of cranberry, raspberry, and elderflower. I do not generally like hot drinks, but as I have never tried a fruit tea before, I thought I would give it a try. Unfortunately it just tasted like hot water, and has confirmed it once and for all that whether it be fruity, herby, or chocolatey, I do not like hot drinks. When it came to the food, however, that was a whole different matter. The sandwich selection included cheese & cucumber, ham & tomato, and egg mayonnaise (they also do smoked salmon, but neither of us like salmon, so we asked for them not to do them). They were beautifully presented, each filling being served inside a different type of bread (white, wholemeal, and tomato). I spread the Cornish way. We then moved onto the scones, which were warm to the touch. Mum said they felt like a young bosom (quite how many young bosoms she's been feeling to be this informed, I don't want to ask). Neither of us have tried butter milk scones before, but both of us felt like we had died and gone to heaven. Mum is now on the search for a recipe so that I can make them at home. By this point I was already feeling full, but there was plenty more to go. I'm no fan of marzipan, but their Battenberg was wonderful. The lemon curd in my macaroon was also delicious, but the biscuit itself was too chewy. I also felt the same way with their chocolate cake, which I thought felt stodgy or like it had been sitting around for a while. On the other hand, the non alcoholic syllabub was dreamy, and probably the best dessert on the tray. Finally there was a shortcake biscuit; light, crumbly, and a delicious ending to a special day out.